". . . from whence no traveler can return"
Lehi’s teachings and language concerning death find clear parallels in the ancient Near East. 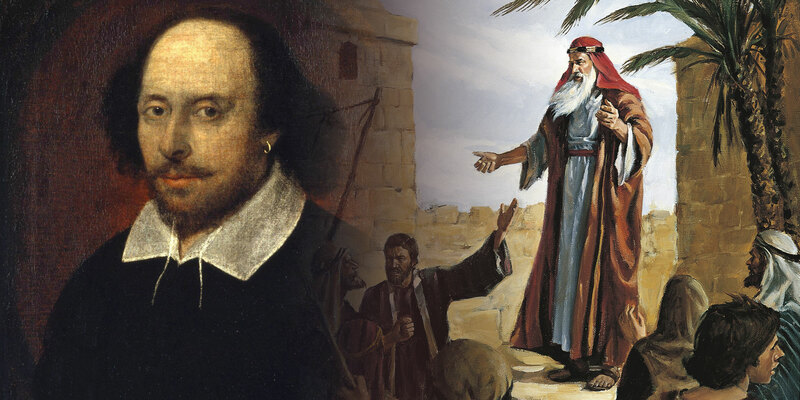 Even if the language may loosely parallel Shakespeare, ultimately both Lehi and Shakespeare derive their imagery on this point from ancient perceptions of life after death. Hugh Nibley, An Approach to the Book of Mormon (Provo: FARMS, 1988), 275–77. Robert F. Smith, “Shakespeare and the Book of Mormon,” FARMS Preliminary Report (1980). 1. Alexander Campbell, “Delusions,” Millennial Harbinger 2, no. 2 (7 February 1831): 92; reprinted in Delusions. An Analysis of the Book of Mormon; With an Examination of its Internal and External Evidences, and a Refutation of its Pretenses to Divine Authority (Boston: Benjamin H. Greene, 1832), 13. Incidentally, not all 19th century critics of the Book of Mormon agreed this was a plagiarism of Shakespeare. “Every school-boy knows that [2 Nephi 1:14] is a paltry imitation of a sentence in Young’s Night Thoughts, and yet the writer of the book of Mormon, would have us believe, that it was within some hundreds of years before Christ!” La Roy Sunderland, “Mormonism,” Zion's Watchman 3, no. 7 (17 February 1838). 2. B. H. Roberts, “A Brief Debate on the Book of Mormon,” in Defense of the Faith and the Saints, 2 vols. (Salt Lake City: Deseret News, 1907), 1:332–333; Hugh Nibley, An Approach to the Book of Mormon (Provo: FARMS, 1988), 275–77. 3. Robert F. Smith, “Evaluating the Sources of 2 Nephi 1:13–15: Shakespeare and the Book of Mormon,” Journal of the Book of Mormon and Other Restoration Scripture 22, no. 2 (2013): 101–102. 4. Smith, “Evaluating the Sources of 2 Nephi 1:13–15,” 100–101. See also E. A. Speiser, “Descent of Ishtar to the Netherworld,” in The Ancient Near East: An Anthology of Texts and Pictures, ed. James B. Pritchard, rev. ed. (Princeton: Princeton University Press, 2011), 77. 5. Smith, “Evaluating the Sources of 2 Nephi 1:13–15,” 102. 6. Smith, “Evaluating the Sources of 2 Nephi 1:13–15,” 102. 7. Nibley, An Approach to the Book of Mormon, The Collected Words of Hugh Nibley: Volume 6 (Salt Lake City and Provo, UT: Deseret Book and FARMS 1988), 277.